CSI Custom Homes brings over thirty years construction industry experience to every project, but our strength goes beyond just building. From initial design to final walk-through, we take a hands-on, team approach that allows us to personally ensure your satisfaction. At the outset, we establish a true collaboration with you. We start by listening to your goals and lifestyle needs then we develop a precise plan to exceed your expectations. Whether you have blue-prints in hand or need help to assemble a design team, we set the focus on your vision and assume responsibility for all aspects of the building process. 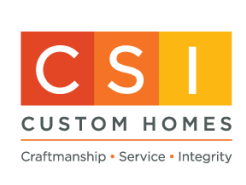 ﻿CSI Custom Homes is passionate about creating highly-crafted, exceptional homes while delivering an unparalleled experience in customer service. We achieve this through open communication, scrupulous attention to detail, and a strong commitment to proactive solutions. Over the years, we’ve also maintained enduring partnerships with leading architects, designers and subcontractors to provide a consistent client experience. With CSI Custom Homes as your advocate in the building process, you can be confident that your project will be built to the highest standards, using only quality materials and proven professional services. As the co-owner, principal and chief financial officer at CSI Custom Homes, Todd Blocker brings over thirty years’ experience in home-building and construction project management to benefit CSI’s clients. Todd began his career a carpenter for an area home builder where he honed is eye for detail and dedication to craftsmanship. Later, as a foreman then a supervisor and manager on projects from simple remodels to large custom homes and commercial projects, Todd gained valuable experience in budgeting and estimation, as well as manpower allocation and supervision. Throughout the years, Todd has developed a reputation for being a true advocate for his customers not only through his expert guidance, but by listening to his customers’ needs and protecting their interests throughout the building process. Todd holds a Bachelor of Science degree in commerce and finance from the University of Santa Clara, and studied architecture at Arizona State University and the University of Colorado. With more than thirty years in the construction industry, Mike Maldonado is known for his precision craftsmanship, attention to detail, and ability to deliver superior customer service. Mike began his construction career as an ambitious apprentice right out of high school. Through hard work and dedication, he worked his way up to journeyman carpenter and later went on to be the sole proprietor of his own construction company in Sunnyvale, California. In 1998, Mike joined forces with Todd Blocker to form CSI Custom Homes where today he holds responsibility for all phases of construction, from budgeting and estimating to hands-on supervision, manpower allocation, company administration, and, most importantly, client satisfaction.